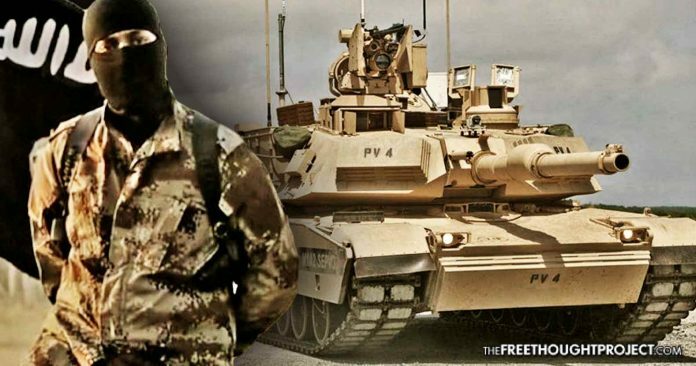 The Department of Defense has admitted that $80 million worth of M1 Abrams tanks were handed over to a supposed Iranian backed terrorist group. Washington, D.C. — (ZH) The Lead Inspector General has released a report to the United States Congress on Operation Inherent Resolve (OIR), the overseas contingency operation (OCO) to combat ISIS. The report covers the status of foreign operations from the period of Oct. 01, 2017, to Dec. 31, 2017. The audit specified as many as nine M1 Abrams main battle tanks worth just over $80 million in inflation-adjusted dollars provided to Iraq’s military for the fight against the Islamic State (IS) ended up in the hands of Iranian-backed terrorist groups. The audit details that Popular Mobilization Forces (PMF) obtained the tanks, which ultimately were seized by ISIS after the fall of Mosul and the second battle of Tikrit. This quarter, the Department of State (DoS) acknowledged that some U.S.-provided military equipment sent to support the mission, including as many as nine M1 Abrams tanks, had fallen into the hands of Iranian-backed militias that fought against ISIS in Iraq. The DoS pressed the Iraqi government to prioritize the return of defense articles provided by the United States as designated in the sale agreements. Further, the audit highlights that the DoS and Department of Defense (DoD) have many “challenges” when it comes to accountability of arms and equipment transferred to the Iraqi Army, which has ended up in the hands of terrorist organizations. The challenges for the DoS and DoD to account for the whereabouts of arms and equipment transferred to the ISF have grown since the fight to drive ISIS from Iraq.248 During the past quarter, the DoS reported that it continued to stress to the Iraqi government that it had an obligation to maintain U.S.-origin equipment under the operational control of the end-user designated in the sale agreement. Further, the DoS pressed Iraq to act as quickly as possible to return these articles to their intended recipients. According to Kurdistan 24, General Dynamics removed its staff from Iraq once it learned that the Iraqi Army gave Abrams tanks to illegitimate armed groups. According to the report, the US company had previously informed the Iraqi government about the provision of Abrams tanks to armed groups that do not belong to the Iraqi army. After the company’s compliance, the Iraqi government retrieved one of the tanks from the Hashd al-Shaabi during an anti-Islamic State (IS) operation in Anbar Province, the report added. If the DoS and the DoD transferred M1 Abrams tanks to Iraq’s Defense Ministry despite the understanding that it could be given to PMF or other terrorist organizations, then the DoD could have violated the Leahy Law – which prohibits the United States military industrial complex and the DoS from selling defense products to security forces guilty of abusing human rights.